March. 15, 2018, 7:30 a.m. to 9:00 a.m.
Now, how about a new journey? This journey is clearly "A Road Not Taken”. Please excuse me for using Robert Frost's famous poem and Max Boot's newly published foreign affairs book on Viet Nam, entitled The Road Not Taken, as an introduction to the next book session, but clearly two geographical areas that are always neglected, probably because of unfamiliarity, are Eastern Europe and the Balkans. This next book session on Romania and its neighbors will attempt to remedy this overlooked situation. Romania lies adjacent to Russia, a key country for Russia's future ambitions. 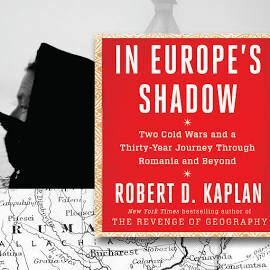 In Europe's Shadow, Two Cold Wars and a Thirty-Year Journey through Romania and Beyond published in 2016 is the second to last book by the journalist and historian Robert Kaplan. After being released from the Israel Defense Force (IDF), Kaplan began a lifelong journey to study and report geographical areas extremely neglected by journalists. His widely popular book, Balkan Ghosts, is a survey of these interaction of ethnic groups in the Balkans and how these ethnicities have been influenced by their larger European and Asian neighbors. In Europe's Shadow, like all Kaplan's books, is a travelogue, journalistic reporting as well as the history of Romania and its’ neighbors. Kaplan writes that it was many years late into his career before his writing gained sufficient attention for him to make a reasonable living. Currently, having written 14 popular books, Kaplan has achieved success among his colleagues and his readership. Among many other things, Kaplan is a senior fellow at the Center for New American Security and a visiting professor at the U.S. Naval Academy Annapolis. The cover jacket says, "Kaplan examines large questions of geography, imperialism, the roll of fate in international relations, the Cold War, the Holocaust and more." Kaplan, examines in detail, Ion Antonescu, Hitler's accomplice in Romania and later Nicole Ceausescu, the Romanian communist strongman after World War II. Maps are presented early in the book for geographical clarification. An additional enhancement of the book is Kaplan's discussion of literary giant novels like Thomas Mann's, Buddenbrooks and Magic Mountain and Joseph Conrad's travel fiction. Numerous other fictional and non-fictional writers are mentioned along the way. Kaplan is an economic conservative and quotes the Romanian physicist philosopher Horia-Roman Patapievici who criticizes the communist economics of Romania in favor the 19th century economic thoughts of Tocqueville, J.S. Mill and the 20th century thought of Karl Popper, Frederick Hayek and Ludwig von Mises. In chapter five, entitled The Great Cemetery of the Jews, he describes the Romanian Holocaust whose issue is revived in a May 11, 2016 WSJ article that says the Romanian government finally is considering retribution by returning Jewish confiscated property but, certainly cannot replace the many lost lives due ethnic cleaning.aci Kaplan's writing is praised by many for discovering and revealing unknown information about an unknown area, however, at least one critic, Edward Lucas in the February,19, 2016 book review in the WSJ argued Kaplan interjects too much personal feelings about the countries visited. Lucas claims these personal observations detract from his journalistic reporting. I will let you be the judge! Eastern Europe, Central Europe and the Balkans are as mysterious as the vivid gothic descriptions of the Irish writer Bram Stoker's Count Dracula of Transylvania Each country with its unique ethnicity is more fascinating than the other. it would be incorrect to refer to many of these people as being nationalistic since many areas were constantly invaded and occupied and area name changed regularly , nevertheless, ethnic pride and vengeance was never lost on its people (see the movie Before the Rain) . It is fascinating that little is known of these areas except the knowledge of the 1914 assassination of Archduke Franz Ferdinand heir to the Austro-Hungarian, entangling alliances among the leading countries of Europe and Asia and the subsequent outbreak of World War I. While, Kaplan does not discuss King Carol II Hohenzollern (ruled Romania between 1930 and 1940) and his Jewish mistress Elena Magda Lupescu, I would recommend pp. 85-90 in Robert Kaplan's The Balkan Ghosts or Googling these historic Romanian figures. The research will provide additional knowledge of Romanian leadership (see Nicole Ceausescu and Marshall Ion Antonescu relationship with the Russian communists and Hitler's Germany and the treatment of minority ethnic groups). 1. Kaplan's Prologue is particularly interesting as a tutorial on how to become a foreign correspondence journalist covering a geographical area previously ignored by other journalists. 2. Eastern and Central Europe is sandwiched between the major powers of Europe and Asia and the natural resources in the South. As mentioned earlier, many areas in Eastern and Central Europe were over run with invaders. What is Kaplan's attitude toward neutrality and appeasement as a method to dealing with foreign invasions? (p. xxxii) For extra credit Google The British journalist Rebecca West's attitude on this issue as she wrote in the 1930's Black Lam and Grey Falcon, her journey through Yugoslavia. 3. What are the countries normally considered as part of Eastern and Central Europe? 4. What nations border Russia and why is this important to the European Union and US foreign policy? 16. Did you find Kaplan's numerous mention of books used for research and his recommended books for readers a distraction?